Francis Uzoho has been left out of the Anorthosis Famagusta squad for their First Division match against Nea Salamis on Saturday afternoon. The Board of Directors of Anorthosis issued a statement on Friday explaining that the Nigerian has been dropped from the squad due to the climate of recent days and to avoid further disruption and rumors. 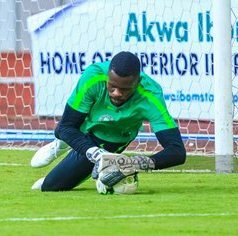 Anorthosis Famagusta had sought clarification from the Cypriot Federation with regard to the eligibility of Uzoho for today's match and their answer was positive but the Super Eagles glovesman is not in a good psychological condition. According to Goal Cyprus, the Vice Chairman of Anorthosis, Dr. Kyriacos Yiangou was arrested last night and the judge has ordered a three-day detention of the club official so as to enable the Police continue their investigations. Uzoho visited the Police Station on Thursday evening as part of the ongoing investigations of the Cyprus Sports Organisation (KOA) regarding the procedure of issuing him a health certificate. Preliminary investigations suggest that the mandatory health card issued to Uzoho is bogus as he arrived in Cyprus shortly before 1600 hours on February 1, about an hour before KOA’s offices closed. Super Eagles coach Gernot Rohr will be monitoring with interest the current challenges being faced by his first choice goalkeeper as he is expected to announce his squad for next month's international matches in the coming weeks.